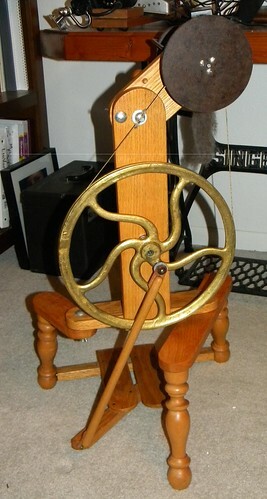 “Debbi”, 1980’s solid brass wheeled spinning wheel from builder C. Norman Hicks rescued from a storeage unit in California has made it’s way to Florida. 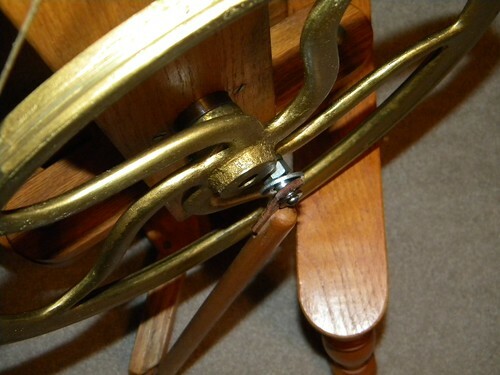 Solid oak castle wheel has scotch tension and inovative system for tensioning. eBay wheel arrived at her new home yesterday (8/15/2013). Little “Debbi” was rescued from a storage unit and seller had no information about her. She was numbered (49) and signed by her builder (C. Norman Hicks). A brown envelop which arrived with her included a Polaroid snapshot (I remember those) labeled Christmas 1981. A receipt for purchase was dated Nov 30, 1981 and signed by the builder. Interestingly both the receipt and the notations on the outside of the envelop number her #50. Yes, that wheel’s not painted gold, it’s solid brass! I was in contact with a member of the San Diego Creative Weaver’s Guild who was able to supply a copy of a magazine article from Shuttle, Spindle & Dyepot (Fall 1974) which pictures Mr Hicks. He was reported to have been an active member of their guild and she’s promised to do a bit of research for me. There are two sets of roller bearings for the drive wheel and two sets for the flyer. The flyer bearings were frozen. The wheel bearings were stiff. I soaked all the bearings in penetrating oil and removed the old crusted oil and repacked the bearings with white grease. The rubber band providing flexible tension on the bobbin brake was crystallized and was replaced with a spring. I didn’t have a rubber band in the house so I used the spring. Seems to work but may go back to a rubber band for authenticity of design after a trip to the Staples. The flyer rod was slightly corroded and was cleaned and buffed. The flyer itself is bent copper tubing. It appears brass cup hooks were soldered to one arm of the flyer. The design is interesting. The flyer rod with it’s huge orifice is pressure fitted through two sets of bearings and the pressed board whorls (3) is locked on to the flyer with set screws and an allen wrench. It came with a single bobbin and it would be complicated to change bobbins. I’m thinking the plan was for the spinner to wind off the bobbin. I slathered WoodBeams all over the lacquered wood to clean and feed the wood. There are places where the finished has given way to time but no evidence of water damage or abuse. The bobbin ends are pressed board and the glue holding them have given in to time as well. I re-glued the separated ends with epoxy glue and clamped to dry. Had to wait to this morning (8/16/2013) to try the wheel. It was a bit stiff at first but the yarn built up in a hurry to my surprise; very fast with little effort. I spun both with my right foot alone and with both. Best effort with the two feet working in tandem. The wheel loosened up and we worked well together. Half-moon slot and bolt with wind nut on the front are for adjusting belt tension. When you want to change whorls the top section is tilted and thereby the tension is adjusted. For the largest whorl, the top section is parallel to the table. It’s diminutive size would make it a good traveler, but it’s weight (brass drive wheel) would discourage me from backpacking with it. Very sturdy on its tripod. Well designed and engineered.